Superb and simple stitching in Silver and Ocean tones. Contains Printed Fabric, Complete Instructions & Stitch Guide, Silver Sadis,Beads, Sequins, Silver Metal THread, 11 Art Silks & Needles. 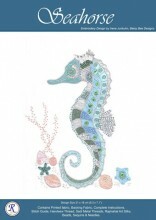 Click the button below to add the Seahorse Sea Horse to your wish list.